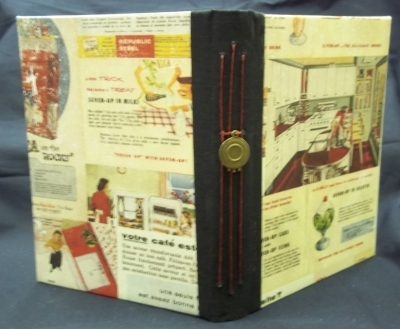 You’ll design the cover using patterned paper from the Farmhouse Paper Company, featuring vintage ads and recipes. Funky vintage kitchen prints will line the inside cover, where you’ll find a pocket that you will make from vintage advertising labels. The cookbook will measure 4.25”x 5 .75” with 48 cream colored, unlined pages. Finishing the cookbook is a bronze dinner plate charm attached to the 3-section pamphlet stitch sewn with Irish waxed linen. Class fee includes all materials and written instructions are provided. Jan is a bookbinding master.